In Thailand we have a type of peanut brittle candy, known as ถั่วตัด Thua Tat. 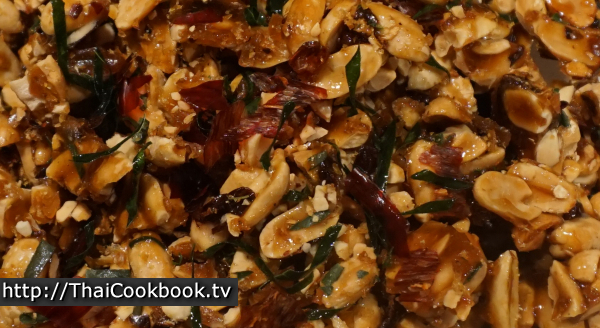 It's very similar to the western kind but we usually make it with sesame seeds and peanuts. 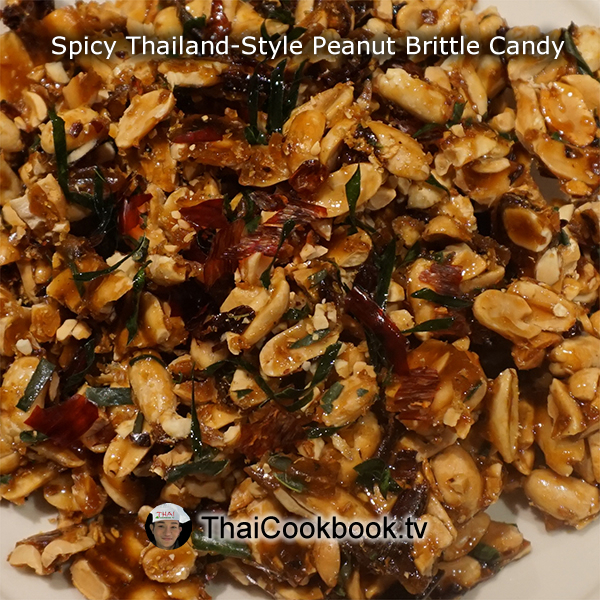 This recipe is my own creation based on a popular packaged snack food sold here that is made from peanuts and flavored with Tom Yum spices. My candy is kind of like peanut brittle, so it's very sweet with coconut sugar, but also has chili, lemongrass, galangal, kaffir lime leaf, garlic, lime, and tamarind flavors. What's in our Spicy Peanut Brittle Candy. 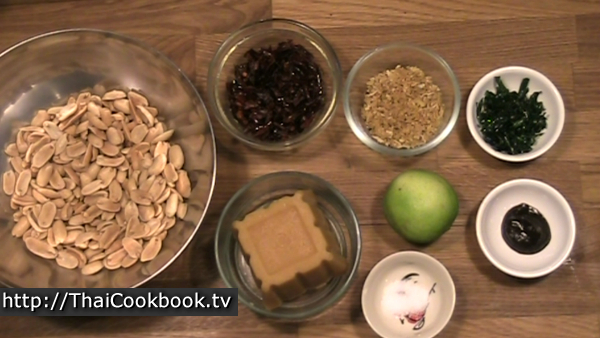 How we make our Spicy Peanut Brittle Candy. 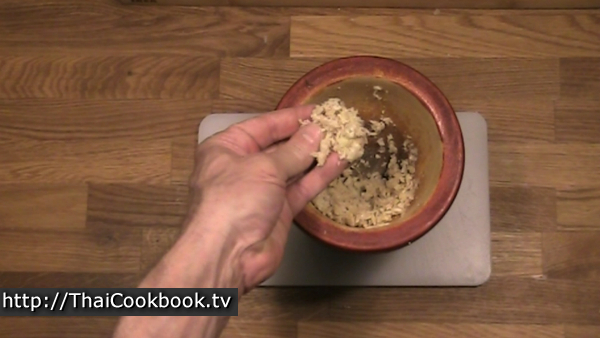 1) Grind the lemongrass, garlic, and galangal root into a rough paste. 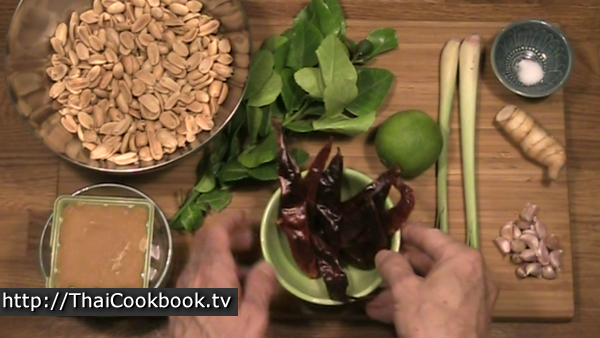 Cut the kaffir lime leaves into strips. Cut the chilies and remove the seeds, then chop into irregular small pieces. 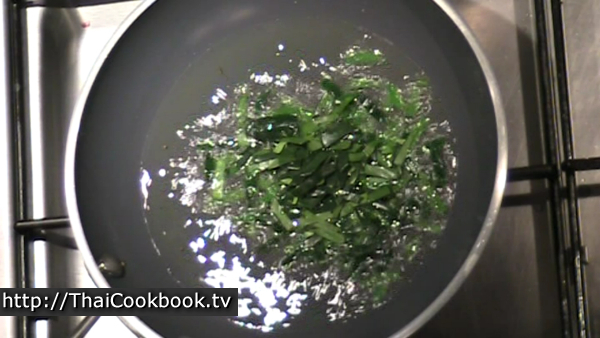 2) Fry the herbs slowly in a small frying pan until crispy. 3) Heat the sugar with some water until smooth and boiling. Add salt and tamarind paste. 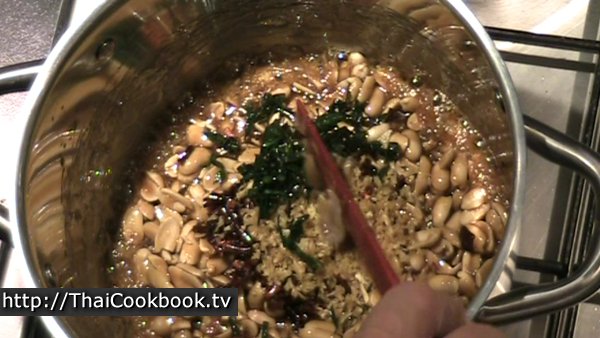 Heat until the sugar cracks in cold water, then stir in the peanuts and herbs. Stir well until very hot again. 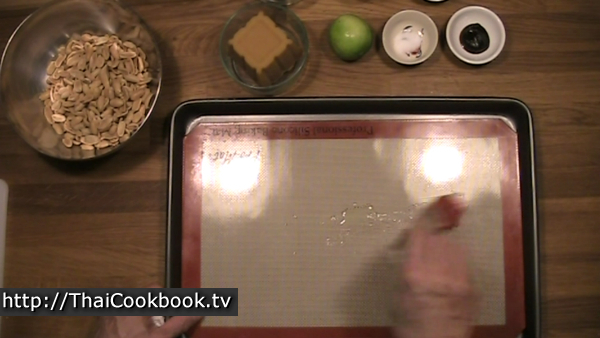 4) Pour the candy onto a prepared baking sheet. Drizzle with fresh lime juice. Allow to cool completely before breaking into small pieces for serving. This candy is very sweet, but also has the most popular herbal flavors of Thailand. I use the Thai long chili, which is considered mildly spicy. The other herbs are lemongrass, kaffir lime leaf, galangal root, and garlic. If you love spicy foods, go ahead and add one or two of the spicy Thai hot chilies. Start by preparing the herbs. Peel and grate about 1 tablespoon of galangal root. 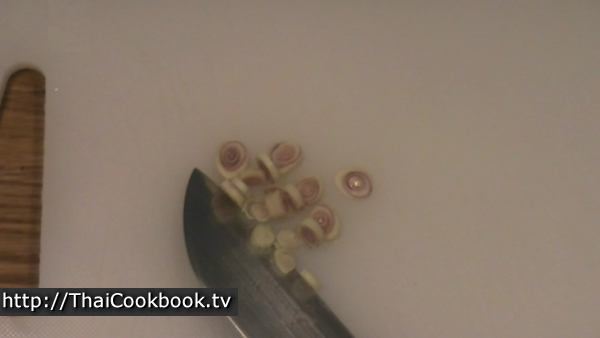 Slice about 1 tablespoon of lemongrass. 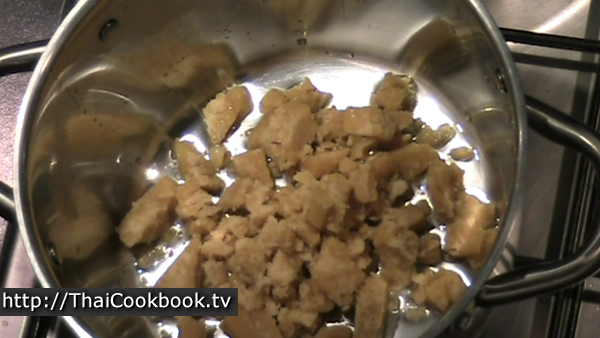 Grind the lemongrass, galangal, and garlic to make a rough pulpy paste. 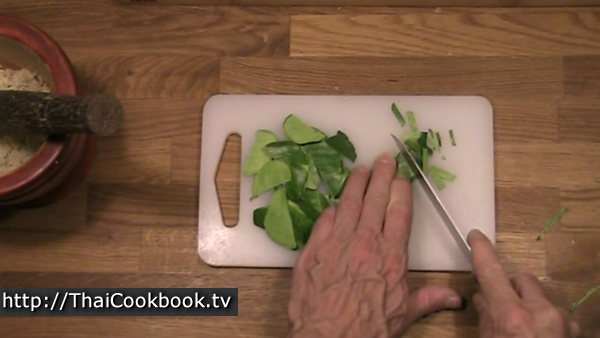 Remove the center stems from the kaffir lime leaves, then cut the leaves across into thin strips. Cut the dried chilies down the middle and remove the seeds. Chop the chilies using a vegetable chopper into rough irregular pieces of varying size. Not too fine, you can use a knife if you don't have a chopper handy. 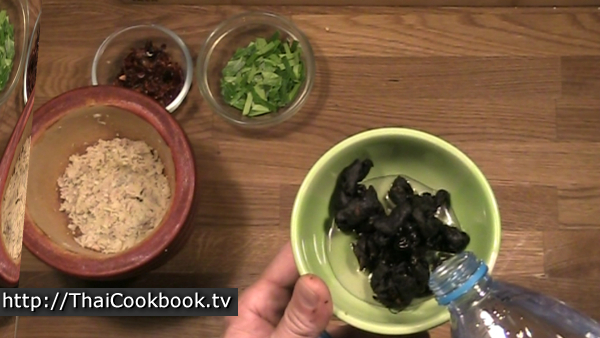 You can use prepared tamarind paste, or make some by following these steps: If not already done, peel the outer shell from some dried tamarind and remove the seeds. Add a little water to the fruit and let it soak for about 15 minutes. Squeeze and mash the softened fruit until you get a soft mush, then push it through a strainer onto a plate. You will have some hard pieces with strings and skin. Discard that. What comes through the strainer is reconstituted tamarind pulp. It is also called tamarind water or juice. For this recipe we need one teaspoon. 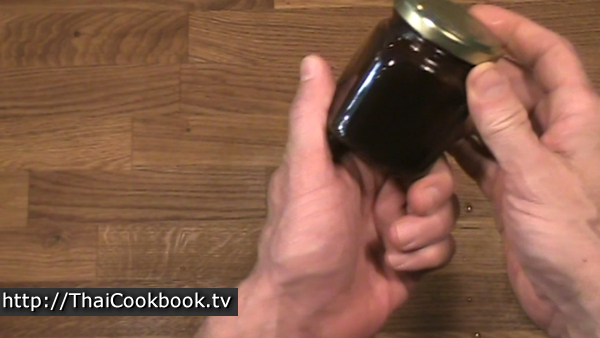 Store the rest in a tightly closed container in your refrigerator. It will keep for a long time if kept very cold. Heat about 1/4 cup of vegetable oil in a small frying pan over low heat. Fry the herbs until lightly crispy. Pour it through a strainer, shake well, and use paper towels to absorb the excess oil. Clean the pan and oil. Over low heat, fry the kaffir lime leaves for about 5 seconds. They fry up very fast, so remove them quickly to prevent burning. 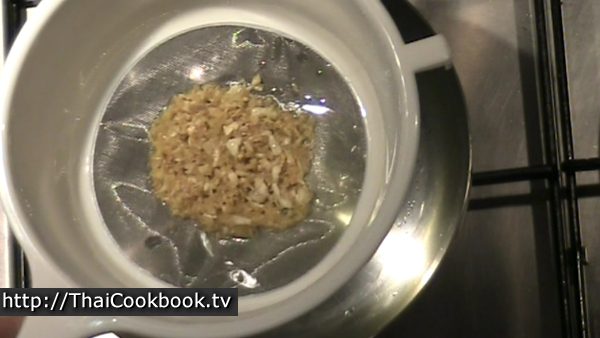 Use the same method of pouring the oil and leaves through the strainer to stop the cooking and cool them down. Now use the same method again for the cut dried chilies. They will cook very quickly and can burn easily. Cook for just 5 seconds, drain the oil, shake in the strainer, and use papers towel. Now you should have all of the ingredients ready to start cooking. Measure out one teaspoon of the tamarind paste, and 1/4 teaspoon of salt. Prepare a baking sheet by brushing on a thin coating of vegetable oil. I use a silicone baking mat, but you do not need one. The mat makes the whole thing easier to break up once cool. Use a big pot over a small burner to prevent the sugar from burning on the sides of the pot. Heat 1/4 cup water over low flame and add the coconut sugar. Keep stirring while it gets hot, the sugar melts completely, and it starts to boil. Keep the heat low so it bubbles slowly. Sugar can get too hot and burn, which spoils the flavor. 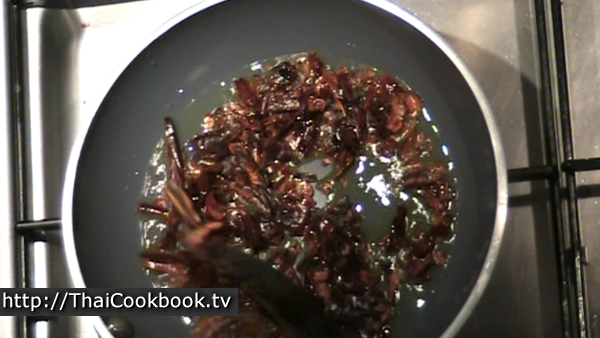 Stir in the salt and the tamarind paste and continue boiling. In order for the candy to be hard like glass when cooled, it needs to get hot enough. 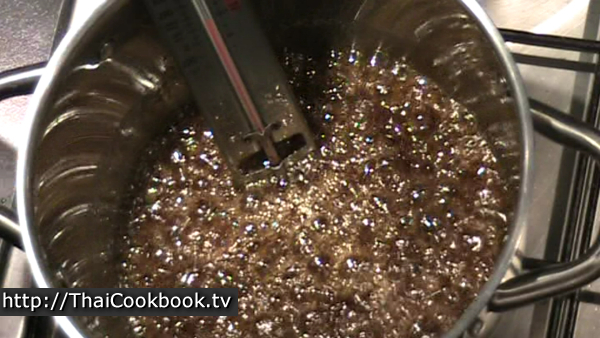 Use a candy thermometer and slowly increase the heat until it reaches about 120°C or 250°F. If you do not have a thermometer, you can drizzle a little of the sugar in very cold water. When it immediately gets hard in the water, it's ready. 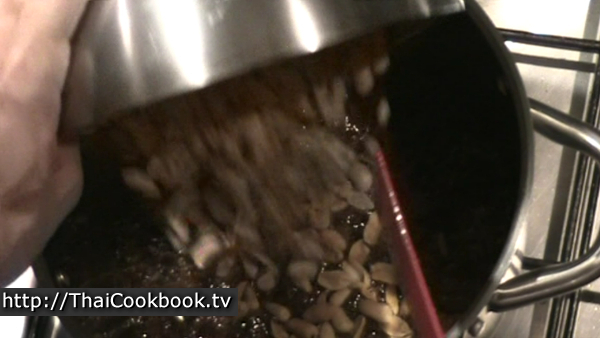 Add the peanuts and stir them in well. This will cool everything down, so keep stirring until it gets hot again. Turn the heat up, add the herbs, stir it all up well for about 15 seconds, then turn off the heat. 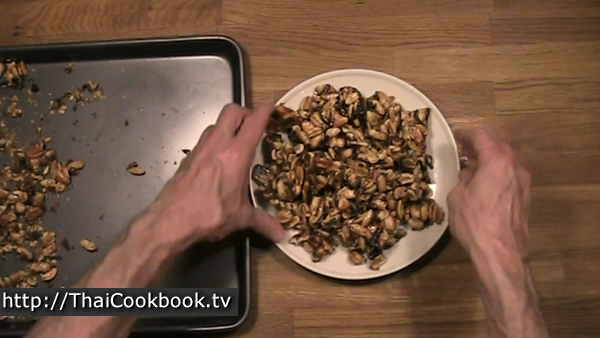 Pour the candy out onto the baking sheet and spread it out until it is about one peanut thick everywhere. Squeeze the fresh lime over the hot candy so that it is evenly distributed. Little droplets of lime everywhere, not wet. Allow the candy to cool down, then put the whole pan in the refrigerator so it gets very cold. After getting very cold, turn the baking liner over and hit the candy with a mallet to break it into little pieces. If not using a liner, just hit the candy and it should break up just fine. If serving right away, put some on a plate. If saving for later put it in a rubberware container with a tight lid. Store in the refrigerator. For an extra nice effect, sprinkle some more kaffir lime leaf and chili over the top before serving.